Ready to find a pet? We have beauties that you can meet! 2 Great Reasons to Adopt a Shelter Cat! Many cats in shelters were once someone's pet, and in good health and good spirits. All they need is a good home! In addition, DID YOU KNOW that children who grow up with pets may have fewer allergies and stronger immunities? This has been well-researched! 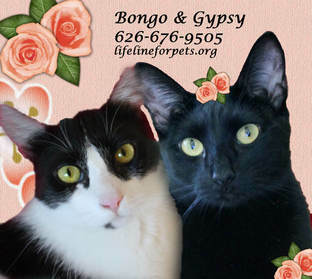 BONGO & GYPSY are AVAILABLE. See them on our Teens/Adults page. 1. TWOFUR OFFER: Adopt any two kittens or bonded cats and it's a "two for one" price! This GREAT SAVINGS includes kitten vaccines, spay/neuter, and microchips. See one you like but not sure about a second? We can advise . 2. 50% DISCOUNT ON EASY SPECIAL NEEDS KITTIES , such as being very shy, or having the condition called FIV+. We can't take these cats to adoptions, but they deserve to have a home as much as any other pet. There are MANY BENEFITS to adopting a special needs pet, yet most folks turn their backs on them because they think they are "less than perfect." However, WE KNOW that they are "purr-fectly" precious. If you have a heart willing to help, we hope you will consider expanding your circle of compassion to include an easy special needs cat.